How do you respond when something doesn’t go your way? Do you throw a pity party? Do you allow yourself to be easily discouraged? When things don’t go your way, do you allow it to distract you from your goals and the bigger picture? Do you lose sight of the journey ahead because you hit a little bump in the road? And to make sure you get the very most out of your disappointment, do you dwell on it and justify to yourself, over and over, why you have the right to feel hurt and disappointed? Spiraling down, further and further into your negative thought patterns? So many people focus on the little things that didn’t work out just the way they wanted, ignoring the overall success of a situation, or the valuable lessons to be learned. Their glass is always half empty. They focus on the lack of what they wanted and on how life had dealt them a rotten hand. Their focus is on all of their disadvantages and not on their blessings and their skills. And what is that change? Our ‘long distance mentor’ Jim Rohn believed that to find success, we must learn to “discipline our disappointment.” The path to success in this business and in life is not about avoiding disappointment, but it’s learning to take it in stride, learning to overcome challenges, learning to see the positives and separate yourself from the actions and choices of others. You simply cannot take disappointment personally. When a prospect doesn’t respond the way you want them to, or a customer cancels, it’s not a reflection of you as a person or your abilities. Now, if you are making radical errors, that’s a different story. But, in the normal course of events, your prospect’s response has very little to do with you. It does not matter your position, or how many skills you have, there will still be those times when nothing seems to work right. That’s just the way it is. You don’t need to be perfect. No one is. There are those people in life, and certainly in this business, that just have that little extra something that makes people want to be a part of what they are doing. But you will find that there are times when even the most charismatic, passionate, dedicated leader can’t find the right thing to say to get some people. That’s because, for some people, there is nothing that can be said. For some, it doesn’t matter what you do or say, or how great the product or opportunity, some just won’t join, and there is nothing you can do to change that, because it has nothing to do with you! So why take it personally? You will also notice, from those successful people, that things just seem to miraculously go their way. Well, that’s because they all have one thing in common — a positive mental attitude with their thoughts focused on the glass being half full (until is filled to the brim!) and expecting things to work out in their favor. These people don’t focus all their attention on their weaknesses, they focus on their strengths! They don’t spend their lives complaining about how bad things are, they go make them better for themselves, their families and their teams! What type of person do you want to be? If you choose to always see your glass half empty your life will forever feel empty. 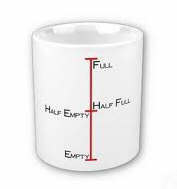 If you choose to begin to see it as half full, then your “glass” and life will overflow! It’s all up to you and where you choose to focus your thoughts. Believe you can do it and you will.